The Unassuming Economist | How can Natural Gas from TAP increase Productivity? “Natural gas will have significant implications on Albania in the medium term. Substituting natural gas for electricity will reduce business costs and households’ expenses. The cost reductions for firms and households will not be minor considering the cost of heating can be reduced to 1/3 by substituting natural gas for electricity. The challenge is that the existing pipelines and distribution networks are almost obsolete. Construction of new pipelines and distributions networks will be needed. The government is already analyzing the cost and potential tariffs. The economically feasible infrastructure has an approximated cost of €0.5 billion for the distribution network and about €0.2-0.3 billion for the main pipelines. 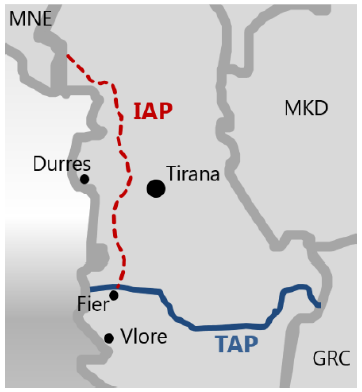 A key component of this new infrastructure will be Ionian Adriatic Pipeline (IAP) to bring natural gas from Trans Adriatic Pipeline (TAP) to the main urban centers (including Tirana).